Studies with a highly specific adsorbent in the clinically relevant large animal model with induced myocardial infarction show a significant and relevant reduction of scar size and improved cardiac performance after CRP reduction. 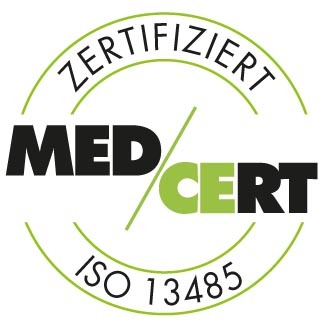 Extracorporeal applications of PentraSorb® CRP is similar to dialysis and similar procedures are established practice in the outpatient and inpatient care. 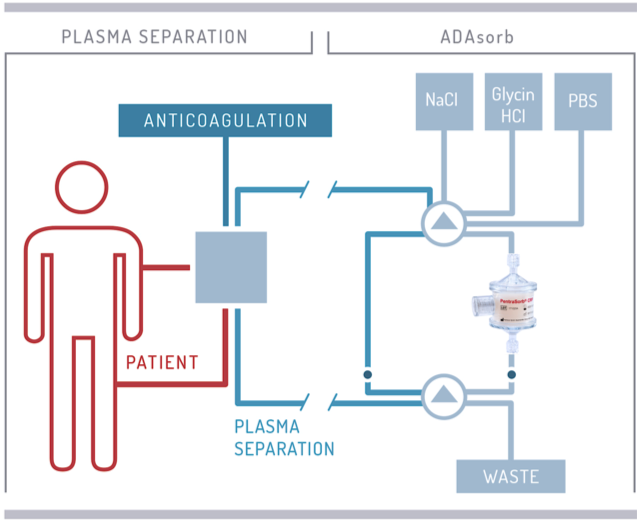 For apheresis, the blood plasma is first separated and then pumped through the PentraSorb® CRP. CRP-depleted plasma is then passed back into the patient. The PentraSorb® CRP can be regenerated, so that several cycles of CRP depletion are possible. For the application of PentraSorb® CRP two devices are needed: a primary device for the seperation of blood from its plasma and a secondary device for controlling and timing of the apheresis cycles. At the moment a program for CRP apharesis is available as secondary device to the ADAsorb® (Medicap Clinic). As a primary device every filter device and centrifuge common to clinics can be used, as long as they are compatible with ADAsorb®. PentraSorb® as well as the corresponding treatment sets can be ordered via us or our sales partners. For contact details click here.